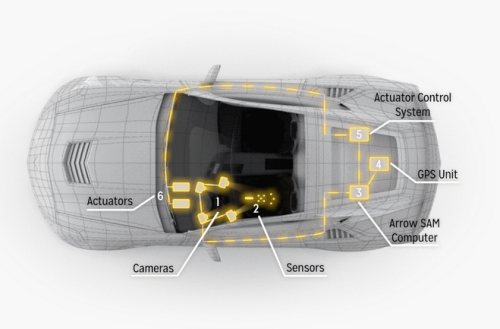 This image of Arrow’s semi-autonomous Motorcar shows the location of its sensors and cameras. Shoddy infrastructure has become a roadblock to the development of self-driving cars, vexing engineers and adding time and cost. The poorly maintained infrastructure is causing problems for human-driven vehicles, not just autonomous ones, Ethan Baron for Silicon Beat. Elon Musk, the CEO of Tesla, recently said it is crazy that so many roads have faded lane markings, as semi-autonomous vehicles depend on them. Fully self-driving vehicles are not yet on the market, and will not be for some years, because there are many problems to iron out, not only weak infrastructure. According to the U.S. Department of Transportation, an estimated 65% of U.S. roads are in poor condition. How Do Autonomous Vehicles See the Road? Cameras, which take photos that are interpreted by a computer. This method is limited by what the camera can see. For example, as this blog has reported, cameras cannot see lines on the road through snow. Radar, which sends out waves that bounce off objects like road signs, other vehicles, and even animals. Although radar has the advantage of being able to work in all weather conditions, it is not able to differentiate one object from another. LiDAR, a technology that sends out pulses of light that are then reflected off of objects. LiDAR can work in the dark, and can define lines in the road. Sage wrote that carmakers including Tesla, Volvo, Mercedes, Audi, and others are fielding vehicles that can drive on highways, change lanes and park without human help. But they are easily confused by faded markers, damaged or noncompliant signs or lights, and the many idiosyncrasies of a roadway infrastructure across state and local bureaucracies. If the lane fades, all hell breaks loose. But cars have to handle these weird circumstances and have three different ways of doing things in case one fails. Some carmakers are finding workarounds so that autonomous cars can work well even with the weak infrastructure. For example, Mercedes-Benz’s “drive pilot” system can work without lane markings by using 23 sensors that can recognize guard rails, barriers, and other vehicles. That system is able to keep cars in lane at up to 84 mph under the right conditions. But such complex technology is expensive. Noting that initial semi-autonomous features add $4,000 to a car’s price, Boston Consulting Group estimated it will cost $1 billion over the next 10 years for the auto industry to research and develop even more sophisticated features.